The way of life and the clothes, clothing and dress of the Native American men and women was dictated by climate and the animals, fish and birds that were available to them. The natural resources and materials available to the different groups in each area or region provided the clothes, clothing and dress of the different tribes. The weather and the changing seasons also impacted the type of clothing worn. The regional cultural groups are categorised as the Northwest American Indians, the Northeast Woodlands American Indians, the Southwest Indians, the Southeast American Indians, the Arctic and Sub-Arctic Indians and the American Indians of California. The men and women of these groups wore different clothing and dress according to the traditions of their tribes and the climates in which they lived. The Pictures of Native American women and men in this section provide an opportunity to study the differences between the clothing, dress and hair styles of the men and women of different American Indian tribes. There are pictures, paintings, images and photographs of the clothes, clothing and ceremonial dress of Native American Indian women and men from all of the main tribes. 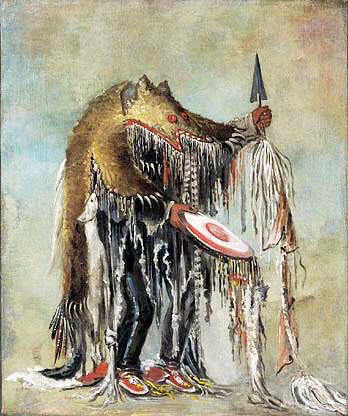 The well known garments and items of traditional clothing and ceremonial dress included the breechcloths, buckskin shirts, deerskin dresses, the fringes, animal robes and furs, feather headdresses, roach headdresses, shawls, headbands, breastplates, belts and pouches of the American Indians. The Native Americans were highly respectful of nature and never wasted any animal products. Hides, leather, fur, feathers, skins, teeth, claws were all put to good use in creating Indian clothing and ornaments, especially by the tribes of the Great Plains. The indigenous American animals used in creating Native American clothing and dress included buffalo, bear, deer, elk, moose, rabbit, fish (skins), weasel, wildcats, otter, ermine and snakeskin. Plants and trees provided some of the most abundant natural resources to many tribes especially in California and the Northwest coast. In many locations the bark of trees, was stripped, dried, and shredded to make fibers. The fibers were used to weave soft, comfortable shredded bark clothing. Great Basin Tribes, such as the Paiute and the Washoe, who inhabited the Eastern desert areas used the shredded bark of the sagebrush to make some of their clothing. Northwest Pacific Coast Indian Tribes, such as the Tlingit and the Chinook used woven spruce root and bear grass to make hats and raincoats. Arctic tribes, such as the Aleut, weaved hats made from from dune wildrye grass. Many Native Americans in the Southwest had grown cotton from very ancient times. Before the arrival of the first Europeans, Southwestern tribes such as the Hopi had developed different methods of weaving and wove the cotton into cloth, creating different styles of cotton clothing. Southeastern tribes such as the Cherokee used mulberry bark to make soft shirts. Mountain-sheep wool and mountain-goat hair was woven by Northwest Coast Tribes, such as the Haida and Tsimshian, who developed the Chilkat weaving technique that was applied to creating blankets and clothes including tunics, shirts, leggings and robes. Trade Cloth was first introduced to Native American Indians during the late 1700's. The Pictures of Native American women and men in this section provide an opportunity to study the differences between the clothing, hair styles and jewelry worn by the different Indian tribes. There are pictures, paintings, images and photographs of the clothing worn by men and women from all of the main tribes. The history of Indian clothing made a radical change when the European settlers arrived. As Native American Indian tribes were forced into closer contact with each other they adopted similar styles of clothing. The headdresses of different tribes were the exception to these adaptations. The introduction of the horse led to many tribes changing their habitat and life style to become nomadic hunters of the Great Plains and the history of their clothing changed again. The history and changes to American Indian clothing changed when the Indians adapted and merged some European styles of clothing with their own.